This is a beautiful study Bible that you can't go wrong purchasing if you love the KJV translation Bible. If you want to study God's word to a whole new meaning and deeper level, with Greek and Hebrew. 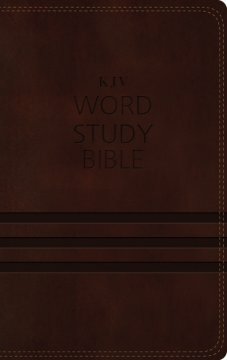 translations, I highly recommend taking a look at this Bible. It will give you a start at learning the Bible in a different way. However, if you are an advanced in your knowledge and or study of the Bible, you may find that this one does not suit you. Personally, I love the look and feel of this Bible. It feels very durable and long lasting. I also love that it lays flat. My only knock against it, I don't like that it is a study Bible, which is what I thought it would be. This Bible is more of a word study Bible than anything. All in all, a great Bible! I give this 4/5 stars and was not require to write a positive review by the publisher.